Look! 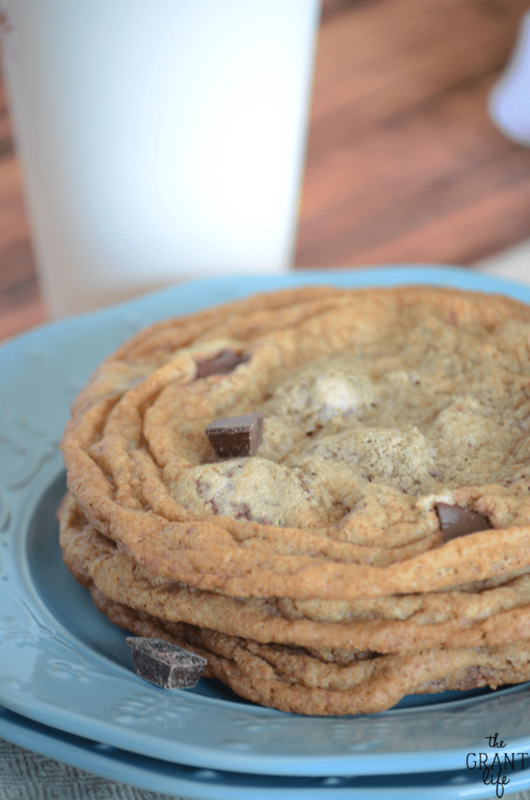 I made you copycat Starbucks chocolate chunk cookies! To be completely honest I made them for me. And I made them in no-spend January because all I wanted last month was Starbucks cookies. Like I needed these cookies! No, I’m not pregnant and was having cravings. 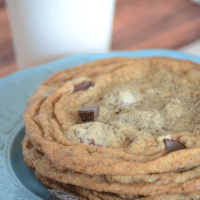 I just really love these cookies and when you can’t have something you want – you want it even more, right? Right. So I wanted these cookies pretty much daily. I thought about them, I wondered if breaking my no-spend was worth it, I might have even dreamed about them. Which would be completely and totally crazy, but it might have happened. And then I figured – umm, self, why don’t you just try to make them at home since the grocery store isn’t part of no-spend month? Ok, I didn’t say that last part to myself, but I made sure to pick up the extra ingredients when I went shopping next. 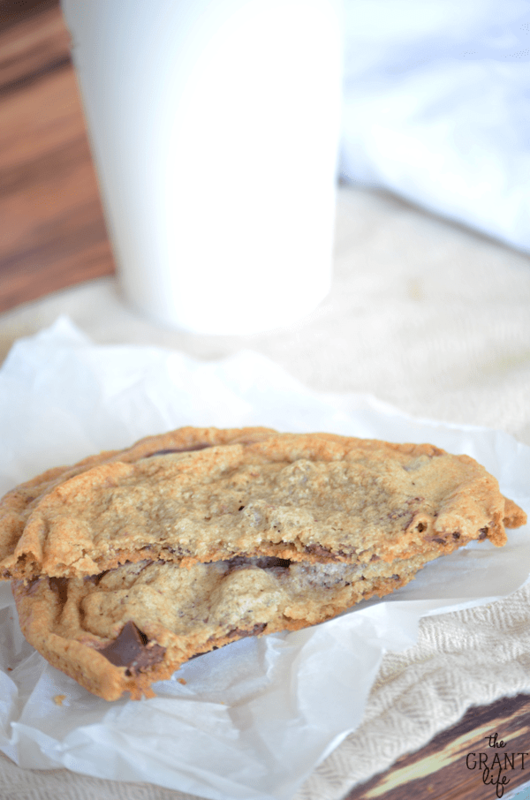 Which really wasn’t much – some whole wheat flour and dark chocolate chunks. Even with the ingredient list it wasn’t crystal clear. There were no amounts and what the heck are niacin, reduced iron, thiamine mononitrate, riboflavin?? I’m not sure but with my assistant by my side, we started taste testing cookies one night. I tried different amounts of baking soda and baking powder to see if they fluffed up enough. I tried chilling the dough to see if that made a difference. I tried eating the dough straight from the bowl just to see if that helped. Although these are not as thick as the Starbucks version, they do have the same consistency. They are slightly crisp on the outside and chewy on the inside. And they are a spot on copycat taste wise. Except I might have made these in my pajamas with my daughter. And when I say I might have, you know that I mean I did. I did make these in my pajamas with my sweet girl. And we ate a bunch of the dough together. What? I already mentioned the dough eating? Just want to make sure we are clear on where I stand on raw cookie dough consumption. To recap – I spent a month trying not to spend money. That included trips to the motherlands; Target and Starbucks. To cope with said restrictions I holed up in my house in my pajamas and made a copycat version of the cookie I may or may not have dreamed about. This is that cookie. This should be made as soon as possible and drink it with a huge glass of milk or a dirty iced chai latte. That last part is your call. The recipe below should make 12 large cookies. Feel free to use less dough per cookie and make smaller ones. Or make larger ones! It’s your call but using 1/3 cup of dough will give you 12. 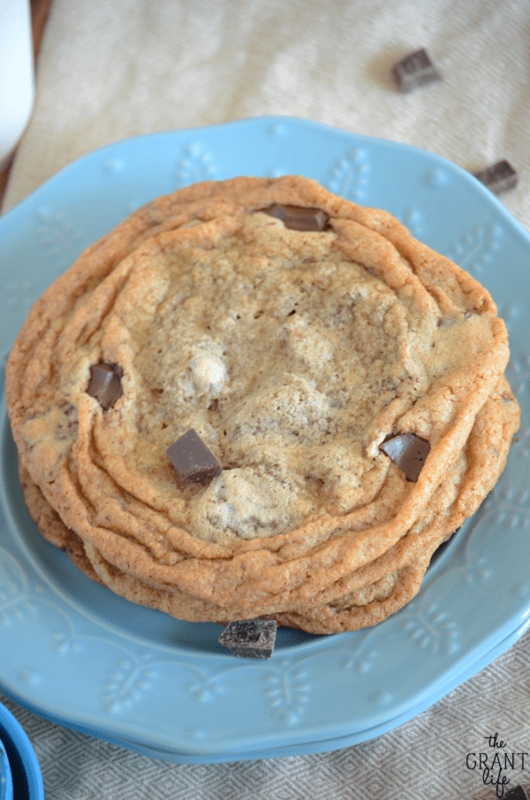 Can I use a metal baking sheet for these chocolate chunk cookies? Yup! You can! I would suggest using a silicone baking sheet or a little baking spray. There is nothing worse then a cookie that sticks to the cookie sheet! Cream the butter and the two sugars together until light and fluffy. Add in the vanilla and the eggs, one at a time. Mix together all the dry ingredients - both flours, baking soda and baking powder. Add in both chocolate chips and stir until combined. Drop 1/3 cup spoonfuls of dough on a silicone baking sheet and bake for 10-12 minutes, or until the edges are golden brown. Remove from oven and place on a wire rack to cool. Ohh.. I’ll have to try that Shirley! Thank you! Big, bakery cookies are my weaknesses. Definitely trying these! I really need to do one of those no-spend months. I think it would be a neat experiment for my husband and I try out. These cookies look great and I love that you used chocolate chunks. That is always my favorite in chocolate chips cookies. 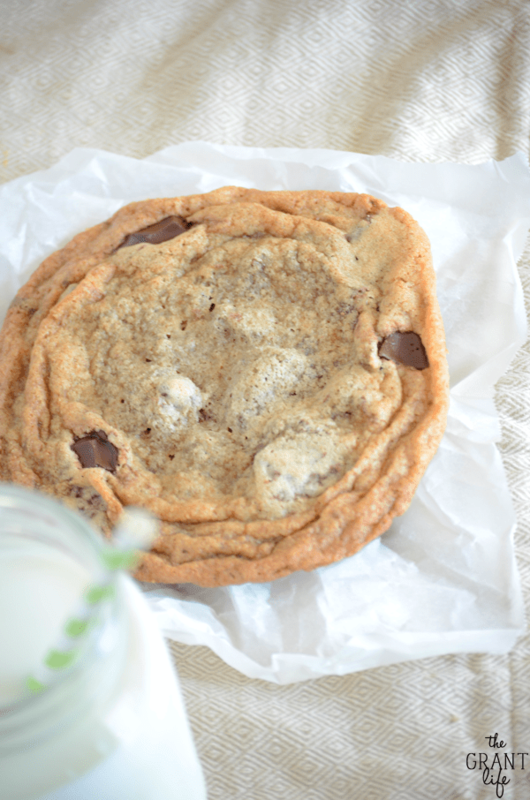 Yum, I love chocolate chip cookies – I bet they were divine warm out of the oven! Yep, I like those chunks. The cookies look great! These look so moist and perfect and I love the chocolate chunks!! These look SOOOOO awesome. YUM! HOW DO THESE COOKIES TRAVEL AND DO THEY STAY CRISP AND CHEWEY FOR SEVERAL DAYS HOW TO STORE THEM? Ours only lasted 3 days before they were all gone! But they stayed nice and chewy. We put them in a plastic bag at night. Worked great! How many cookies does it make??? I believe it makes a dozen cookies. They are larger then normal ones. Hope that helps! Oh my goodness, I’m seriously addicted to Starbucks CC cookies warmed. I mean I seriously crave them. I’m super excited to try this recipe. What brand of chips did you use and do you think the brand will make a difference? Hey Erika! 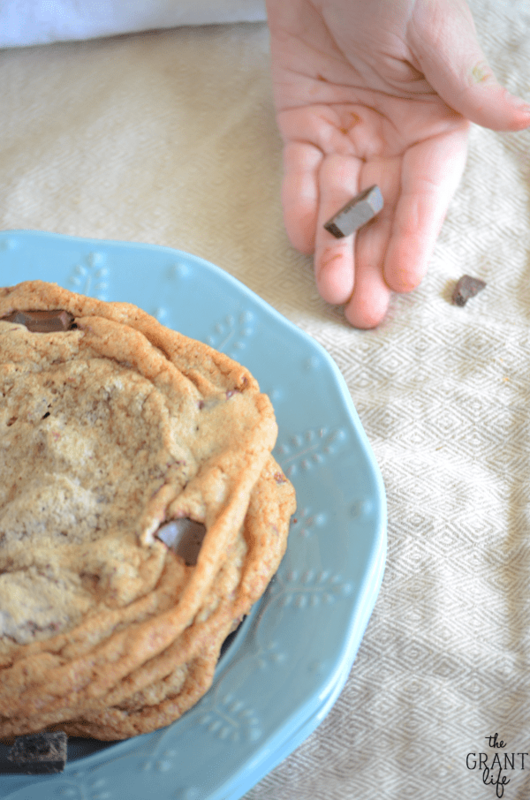 I used Scharffen brand chocolate chunks – http://amzn.to/1nhAgyG. They are the best! I’m sure you can use any chips (or chunks) you’d like. These are my favorite. Hope you enjoy! It should make a dozen large cookies. Enjoy! Okay, so the thing that really made me check out this recipe was the photos — how do you get those amazing wrinkles at the outside edges of the cookie?? They’re beautifully perfect! Is that just a result of the large mound of dough sinking into the lower levels as it bakes? Hey Janelle! Thanks so much. And I believe that’s what happened. I dropped the dough on a silicone baking mat and it sort of happened. Hope you enjoy the cookies! how many gramms do “2 sticks of butter” represent? (or pounds, I can make the conversion myself). Keep on shining! (and… experimenting new recipes. Seriously). How many cookies does this recipe make? Am I missing it? Thank you! I’m new in baking so this might sound like a dumb question but isn’t 1/3 of a cup a lot of cookie dough? Or am i not understanding the directions correctly? Thank you! It’s a good amount of dough. Most recipes call for a tablespoon or so of dough. If you don’t have a 1/3 cup measuring cup, use a little bigger then a golf ball sized piece of dough. If I’m using a metal baking sheet do I need to adjust? No adjustment needed. I used a metal sheet pan with a silicone baking sheet on top. Hope you enjoy!